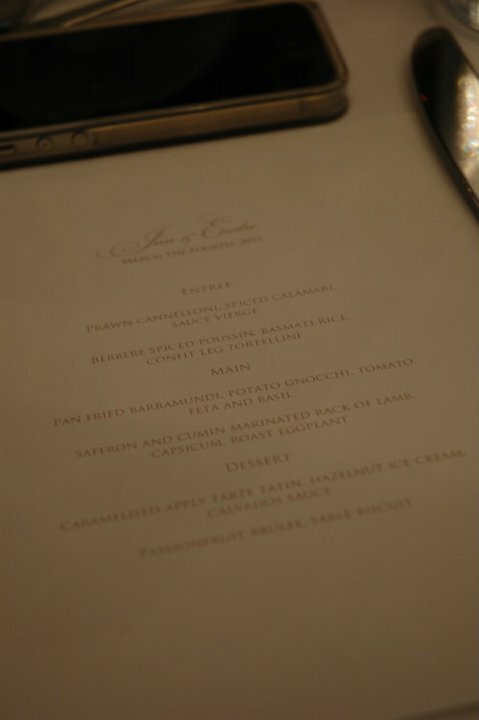 It’s a night to remember for our newly wedded couples, Jun Guo and Endre Kollo. They found this amazing site for their wedding, at the far end of Mosman, called Gunners’ Barracks. Stonewall building right by the sea, overlooking the panoramic Sydney, it was truly a sight to treasure. There were three pre-dinner canapés and regretfully I missed taking picture of the first dish, which was the Aburi Salmon Tempura-coated Sushi. 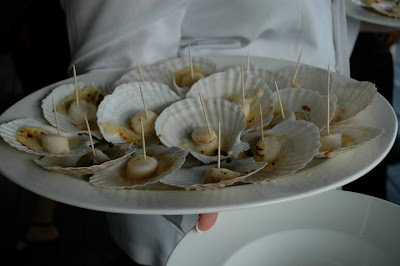 The second one was Grilled Scallops in Cheese. The last one was a Risotto mushroom. There were two alternating sets of dishes presented and like any other French menu, this one was really a pain to explain. 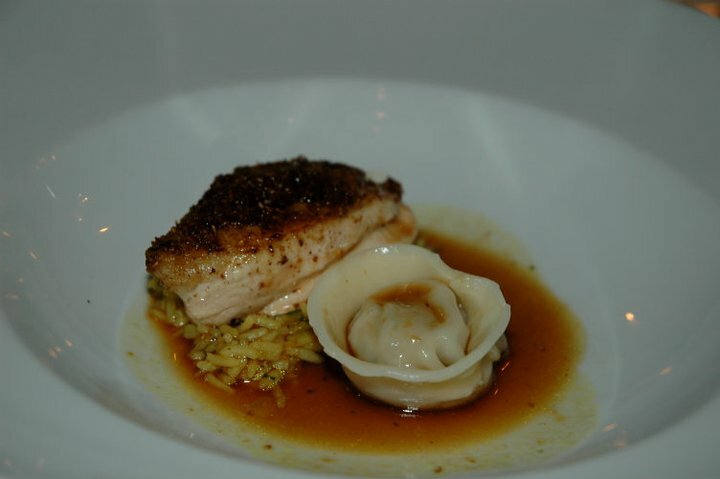 For the entrée, I got Berbere spiced Poussin, basmati rice, confit leg tortellini. Poussin is a very tender 28-days-old chicken simmered in Ethiopian’s Berbere sauce on top of basmati rice with side of duck confit. 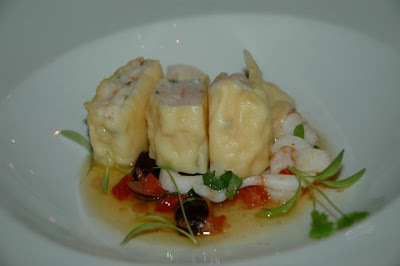 The other dish was Prawn Cannelloni, spiced Calamari, sauce Vierge. 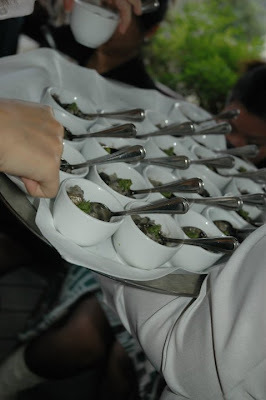 The prawn and calamari were very smooth and the sauce vierge – aka Virgin Sauce (consists of olive oil, lemon, tomato, and basil) really complemented the seafood and created the refreshing taste. The main course was equally mouth watering. My share was Pan fried barramundi, potato gnocchi, tomato, feta and basil. 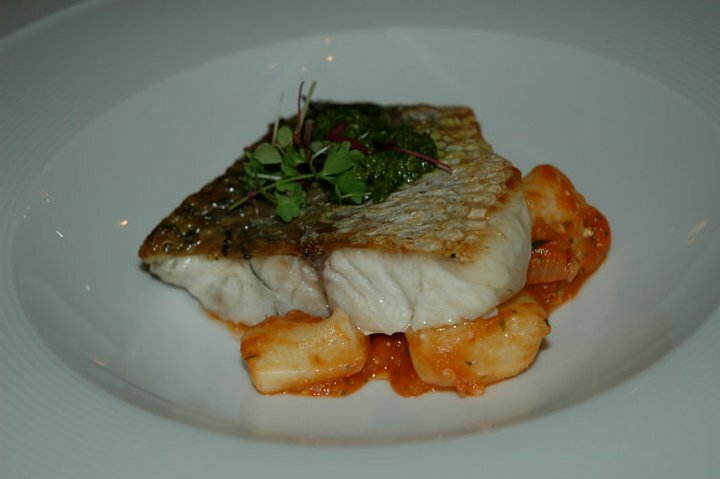 Perfectly juicy barramundi on top of ultra soft gnocchi was a new combination for me and it was great. 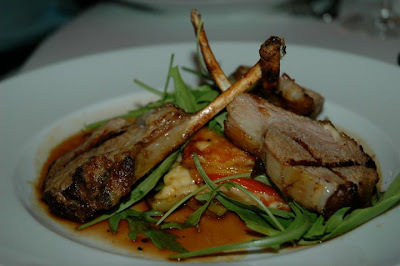 The other main was Saffron and cumin marinated rack of lamb, capsicum, roast eggplant. It was a quite colourful plate with generous servings of lamb. After some speeches from both sides, came the desserts. Caramelised apply tarte tatin, hazelnut ice cream, calvador sauce was really an eye candy. 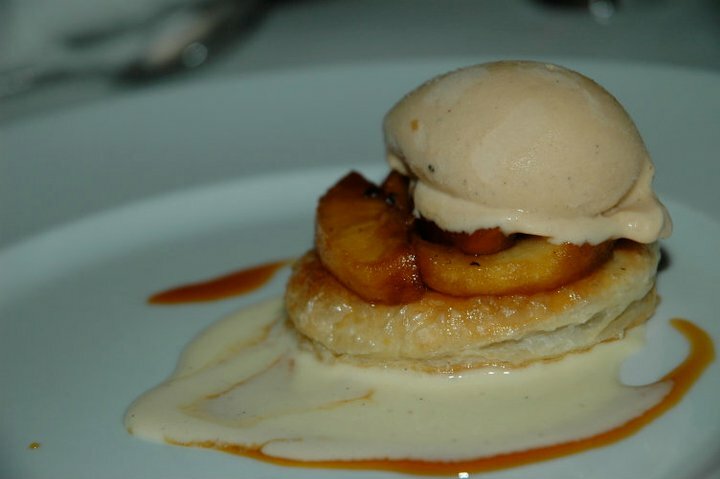 It was an upside down caramelised apple with pastry base topped with hazelnut ice cream. 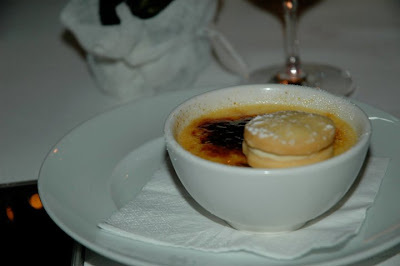 I was also fortunate enough to taste the Passionfruit brulee, sable biscuit. 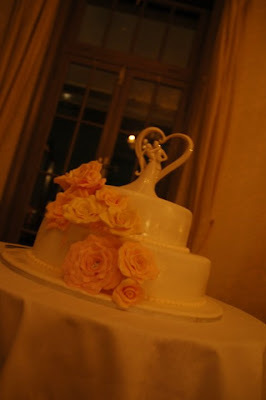 Their Tea Room signature came in when the coffee and tea were served. 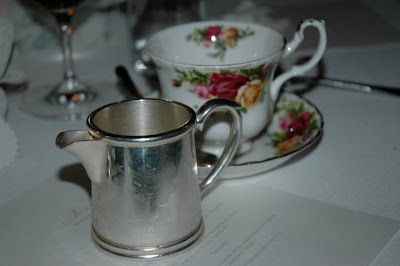 It was a flowery mug with silver milk jug. 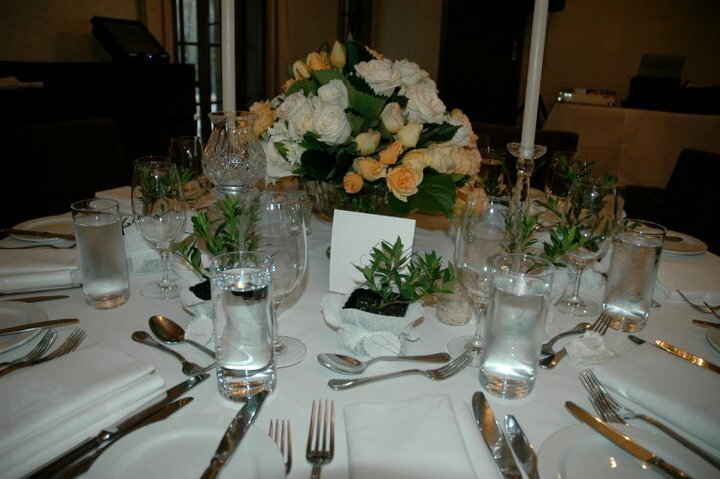 There are two The Tea Room venues in Sydney, but the gunners’ barracks is by far the prettiest. On any other day, The Tea Room serves high tea and other dining menu. 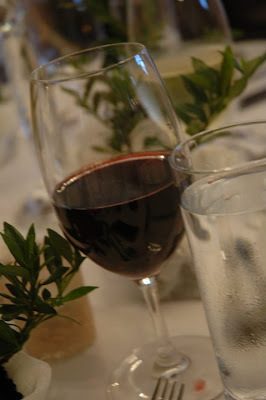 Such a nice blog, thanks for sharing all yummy food dishes.